Election Updates | New research, analysis and commentary on election reform, voting technology, and election administration. Readers may remember that in 2016 a consortium of researchers from across the U.S. (including Caltech) participated in a large study of polling places lines and dynamics in the November general election. The great news is that some of the results have been published in the journal Political Research Quarterly. The study is a wonderful example of how much progress has been made in developing a science of election study. This paper is the result of a nationwide study of polling place dynamics in the 2016 presidential election. Research teams, recruited from local colleges and universities and located in twenty-eight election jurisdictions across the United States, observed and timed voters as they entered the queue at their respective polling places and then voted. We report results about four specific polling place operations and practices: the length of the check-in line, the number of voters leaving the check-in line once they have joined it, the time for a voter to check in to vote (i.e., verify voter’s identification and obtain a ballot), and the time to complete a ballot. Long lines, waiting times, and times to vote are closely related to time of day (mornings are busiest for polling places). We found the recent adoption of photographic voter identification (ID) requirements to have a disparate effect on the time to check in among white and nonwhite polling places. In majority-white polling places, scanning a voter’s driver’s license speeds up the check-in process. In majority nonwhite polling locations, the effect of strict voter ID requirements increases time to check in, albeit modestly. This entry was posted in 2016 Election on April 2, 2019 by Michael Alvarez. In today’s world, the shelf life of a typical academic research article is pretty short. Most papers are published electronically, with a quick and immediate burst of attention (usually fueled by conversation about the paper on social media). After that initial burst of attention, for most academic papers, mentions online and citations quickly wane. So it was with some pride that I heard of continued interest in a paper that I published over a decade ago with Thad E. Hall and Brian F. Roberts, “Military Voting and the Law: Procedural and Technological Solutions to the Ballot Transit Problem.” In the paper, we looked at UOCAVA voting, focusing on how the focus on the issue has changed from concerns about procedures to concerns about technologies. I’ve gone back and re-read this paper, and thought I’d write about it here as it covers the history of UOCAVA voting quite well. It serves as a good primer for the history of the issues surrounding UOCAVA voting, and it really sets the stage well for understanding the challenges that UOCAVA voters and election officials face when they try to make sure that UOCAVA voters can easily and securely exercise their voting rights. The basic technological challenges that we discuss in the paper are as true and real today as they were when we wrote the paper over a decade ago. And the good news is that this paper is available online, so give it a read if you are interested in the history of UOCAVA voting. This entry was posted in Uncategorized on March 14, 2019 by Michael Alvarez. Since the movement towards online voter registration began years ago, there’s been discussion among academics, advocates, and election officials about whether online voter registration will boost voter turnout. The results of this study demonstrate that state online voter registration increases voter turnout. The difference‐in‐difference analysis shows that the states’ implementation of online voter registration increases the turnout of young voters by about 3 percentage points in presidential election years. The instrumental variable analysis shows that the usage of online registration by voters increases their turnout by about 18 to 20 percentage points. According to the analysis reported in the paper, the availability of online voter registration seems to be especially important for younger citizens in presidential election years. This entry was posted in Uncategorized on March 4, 2019 by Michael Alvarez. There’s a call for research papers on election administration, to be published in the journal American Politics Research. The special issue of APR will be edited by Martha Kropf — I’m looking forward to seeing it! I encourage readers who are conducting research on voting technology and election administration to submit their work to APR for this special issue. There’s now a great deal of really fantastic research going on across a variety of academic disciplines, it’s wonderful to see the creation of these venues for publishing that work. Thanks to Martha Kropf for editing the special issue, and to APR’s editor Costas Panagopoulos for his vision to make this special issue possible. This entry was posted in Uncategorized on March 1, 2019 by Michael Alvarez. Today I’m announcing that the MIT Election Data and Science Lab is creating a user group and related listserv intended for data analysts who work for federal, state, and local election agencies. I hope that anyone who is interested will read on. Anyone interested may add themselves to the listserv by going to this link, or by e-mailing me . The idea behind this user group and listserv is based on the observation that election agencies are increasingly hiring employees to provide data analysis in support of election administration. In some cases, these are separate, full-time positions. In others, these are positions for which data analysis is one of several duties. Some of these employees come from data science or policy analysis backgrounds. Others have fallen into the position, as the agency they work for found it necessary to respond to requests for increasingly sophisticated data analysis and data requests. As the number of people providing data analysis to election agencies grows, so does the value of creating a professional community of election administration data analysts. Some of the benefits include learning from peers, working out puzzles, contributing to the development of this field, and sharing the joys and frustrations of the job. One can imagine at least two ways that this community could evolve over time. First, it could exist as an online community organized around the listserv. The model here is something like the election law listserv that Rick Hasen coordinates out of UC-Irvine. That’s the minimalist path. The second path is a little more involved, and have a more face-to-face component. The model I have in mind for this is the annual State Certification Testing of Voting Systems Conference that has been held for nearly a decade. Others will certainly have other ideas. My own hope is that we could evolve this into something like the State Certification conference (which I always call the “Merlefest,” after one of its founders and its soul, Merle King), which has done a great job of building a community among those who are responsible for the voting technology side of the house. Not only has it been a great place to share information, but it has provided a safe place for members of the community to develop a professional identity and accumulate knowledge. For now, we’re starting with a listserv. Our hope is that the listserv would allow election agency employees who work in data analysis to get to know each other and learn from each other. Feel free to distribute this message to others who might be interested. For now, we will restrict membership to people who work for federal, state, and local election agencies. Once a community is established, it can decide whether to add people who do similar work, but for non-election agencies. One last point: Some will notice that although we are suggesting that this be a community confined (at the moment) to employees of election agencies, MEDSL is not such an agency. We recognize the irony. Our goal is to help jump-start this effort. Once it gets going, we can step away, if that’s the will of the group. For now, the important thing is to start. This entry was posted in Uncategorized on January 15, 2019 by cstewart. 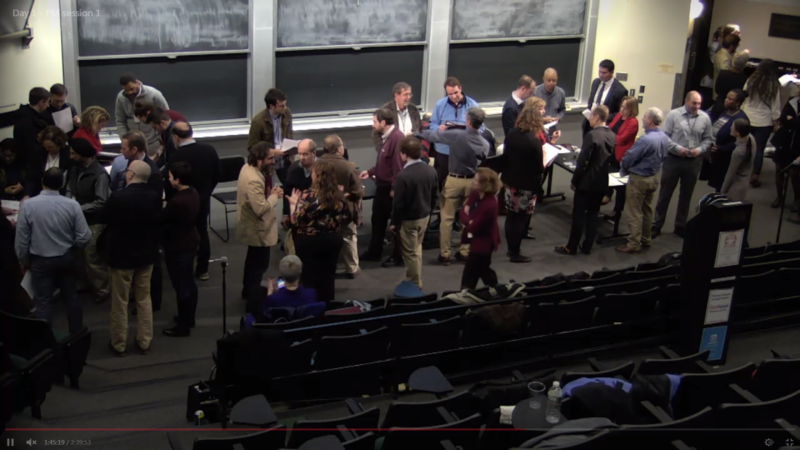 The Caltech/MIT Voting Technology Project hosted an Election Audit Summit last month that was interesting, fun, and a success (if I say so myself). With the holidays now over, it thought I would post my initial reactions to the issues raised at the event. If you want to experience what happened, the conference’s website hosts an archive of the webcast of all the presentations. The presentation slides are posted there, as well. While much of the day-and-a-half event focused on risk-limiting audits (RLAs), the conference covered many other topics as well, such as auditing voter lists, ballots, and the assignment of voters to legislative districts. Attendees covered a wide variety of perspectives — academics, state and local election officials, interested citizens, and committed voter verification activists. In other words, there were people in the room who don’t talk to each other much, and even have been known to talk past each other. My initial reaction to the event are summarized in these five thoughts. RLAs have come a long way. RLAs have a long way to go. Auditing isn’t the only way to ensure election integrity. We need more dialogue like this. Let me expand on these points a bit. RLAs have come a long way in the decade-plus period they have been part of the election reform landscape. RLAs have come a long way along many dimension — theoretical and mathematical justification, practical application, and widespread acceptance. One of the reasons for this progress is that the intellectual pioneers of RLAs, such as Philip Stark and Ron Rivest, have invested precious time and energy to meet with officials, help run pilots, and develop publicly accessible software tools. Progress has been made because states, like Colorado, have invested in passing laws, buying equipment, and rearranging how they run elections, so that RLAs are integrated into everyday election administration. Other states, like Rhode Island and Virginia, have passed laws setting them on a path to eventually following Colorado. RLA still needs its elevator speech. It remains too complicated an idea to explain to a typical state legislator, who will give you five minutes to make your case. The role of the human element still needs to be established and managed. Tons of details need to be managed in implementing RLAs and humans are bad at keeping track of lots of tedious details. What is the role of software in managing the process, and how do we know to trust it? Which contests should be audited? Eventually, all elections should be subjected to a risk-limiting audit, but as the technique is being developed, should we focus on top-of-the-ballot offices or down-ballot offices? How much trust needs to be put into the math, and by whom? Although techniques can be put into place that reduce the process of conducting an RLA to a matter of arithmetic, that arithmetic is based on statistical theory. Who vets the theory? Who sets the standards? Bayesianism vs. frequentism. The canonical RLA models derive from a traditional frequentist approach to statistics. New approaches rely on Bayesian Who choses between approaches? How do RLA laws get written, in a context that the science is still developing? How will RLAs interface with other election-challenge processes? Will the expectation that RLAs be conducted as a part of the canvass process conflict with the goal in close elections to keep ballots undisturbed until the recount? As a general matter, RLA laws may interact with election contest in unanticipated and complex ways. Risk-limiting audits aren’t the only game in town. In fact, in my own view — which is not shared by others — RLAs may end up being a bit player in the drive to increase the degree of quality assurance in elections. At the very least, post-election audits of the vote tally touch on just one aspect of elections where the details matter, mistakes can be easily made, and malicious actors can penetrate. As I noted in my remarks that kicked off the conference, developments since the 2016 election have illustrated that American elections are operating at increasingly close tolerances; mistakes can have material effects on the outcomes of elections. Just consider the evidence provided by the breach of the Illinois voter-registration system, the omission of 118,000 voters from the rolls in Los Angeles County during the 2018 primary, the mis-assignment of voters in the 2017 Virginia state election that may have affected the partisan composition of the House of Delegates, and the ballot-design fiasco in Broward County this year that affected the U.S. Senate race in Florida. This idea, that we need more than just RLAs, is related to an argument made by one of the fathers of RLAs, Philip Stark, who, along with David Wagner, has made the case for “evidence-based elections.” Still, the evidence-based election idea has tended to focus on issues related to tabulation and record-keeping about the tabulation, and I think the horizons need to be expanded even further. While on the issue of expanding horizons, I also should add that two panelists, Emily Beaulieu and Walter Mebane, reminded us that we can learn a lot about election integrity by considering elections in other countries. The tools they discussed are particularly relevant when access to the ballots is precluded. Walter, of course, is well known for developing tools, such as the Election Forensics Toolkit and Guide, that help to conduct forensic analysis of election results, by tagging data anomalies. Emily wrapped up her presentation by noting that in the polarized societies she studies, sometimes social peace is bought by not being as transparent as Americans would like their elections to be. As an observer of election administration trends, it is clear that the world is gravitating toward greater accountability in election administration. One indicator of this trend is the movement toward requiring more sophisticated audits of election. The challenge, as I’ve suggested in this piece, is that more sophisticated vote tabulation audits are still in their infancy, both theoretically and practically, and that other forms of quality control are even further behind. The area of election auditing will only advance with the close collaboration of election officials and technically inclined outsiders, both inside and outside academia. Absent that collaboration, election administration risks making the outcome of elections prey to errors and malicious attacks; the technically inclined also risk looking like arrogant scolds. The most heartening aspect of the audit summit is that people with a diversity of opinions, backgrounds, and capabilities could spend two days listening to and learning from each other. I’m hoping the audit summit can become a regular event. We have a lot of work still to do. This entry was posted in Uncategorized on January 8, 2019 by cstewart.